Assistance upon arrival at Lhasa Airport and transfer to the hotel. 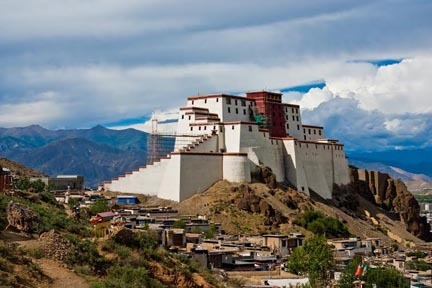 Potala Palace - the architectural wonder in the center of Lhasa is the symbol of that sacred land. When the thirty-third King of Tibet, Soongtsan Gampo was married to Princess Wen Cheng of the Tang Dynasty. It has 999 houses built on Hongshan Hill for his bride, as well as the red building at the top of the hill. In the afternoon visit Jokhang Temple which is one of the most sacred shrine in Tibet and there is always a procession of devout Tibetan Buddhist within the premises, and then we walk through Barkhor Street, which is the oldest street in Lhasa and remains very traditional. 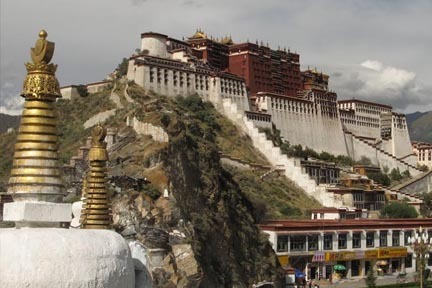 It is a place where Tibetan culture, economy, religion and arts assemble and a must visit place. 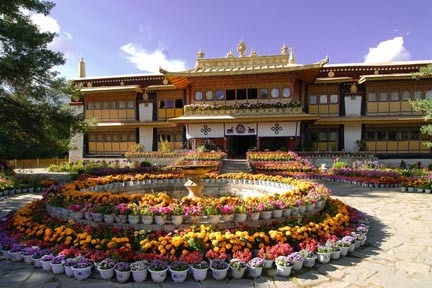 Norbulingka - the summer palace of the Dalai Lama which is two kilometers west of the Potala Palace and located at the bank of the Kyichu River. The garden covers an area of 360,000 square meters, with 374 rooms inside. It is the biggest man-made gardens in Tibet Autonomous Region. Drepung Monastery- which was established near Lhasa, Tibet in 1416 by Chojey Tashi Palden. It had four departments, of which Loseling, or "The Hermitage of the Radiant Mind," was the largest, housing more than three quarters of Drepung's ten to fifteen thousand monks and now it is one of Tibet's premier monastic educational institutions. 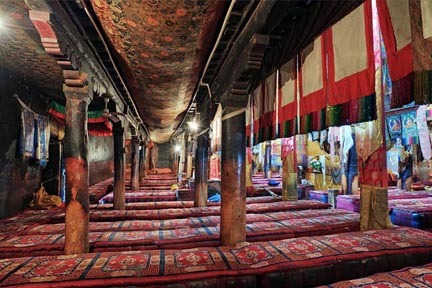 At the last, we will visit Sera Monastery- founded in 1419, at its height, Sera monastery was residence to more than 5,000 monks and five monastic colleges. Although much less active now, with only several hundred monks currently in residence, one of the most interesting times to visit the monastery is in the afternoon when monks, after finishing their morning scripture classes, can be seen debating in the courtyard. After breakfast depart Lhasa for Shigatse visiting en route to visit Yamdrok Lake. Yamdrok Lake. 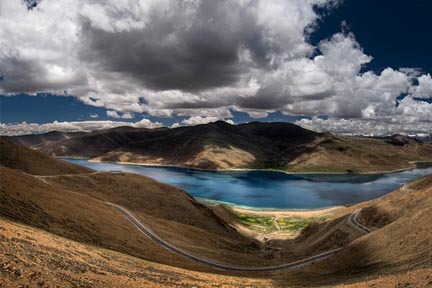 The lake lies to the Shannan Region in Tibet, one of the three biggest lakes in Tibet. Its altitude 4441 meters (about 14,570 feet) . This turquoise green and freshwater lake is a countless depth and is spread in 624 square kilometers making about ten independent hilly islands inside. And then we will visit the Pelkhor Choede, which is a typical Tibetan Buddhist style monastery, lying about 230 kilometers (143 miles) south of Lhasa and 100 kilometers (62 miles) east of Shigatse. Pelkhor Choede enjoys a high status in Tibetan Buddhism history because it houses three sects - Sakyapa, Kadampa and Gelugpa together. After visiting lake drive straight to Shigatse arriving in Hotel. After settling down in Hotel depart for sightseeing of Shigatse, the second biggest city in Tibet is situated at the altitude of 12,600 ft. It is the famous city for its great Tashilhunpo Monastery - the seat of the Panchen Lama, who is regarded as the reincarnation of the Buddha of Endless Enlightenment. After breakfast depart Shigatse for Lhasa en route to visit Tashilunpo Monastery. Tashilunpo Monastery- which is is one of the Six Big Monasteries of Gelugpa (or Yellow Hat Sect) in Tibet. Also called the Heap of Glory, the monastery is located at the foot of Drolmari (Tara's Mountain), Shigatse. Founded by the First Dailai Lama in 1447, the monastery's structure was expanded by the Fourth and successive Panchen Lamas. Tashilhunpo Monastery covers an area of nearly 300,000 square meters (3,229,279 sq. ft.). The main structures found in the Tashilhunpo Monastery are The Maitreya Chapel, The Panchen Lama's Palace and The Kelsang Temple. Tashilhunpo is the seat of the Panchen Lama since the Fourth Panchen Lama took charge in the monastery, and there are now nearly 800 lamas. After sightseeing drive straight to Lhasa arriving in Hotel.